What way is my campaign going? 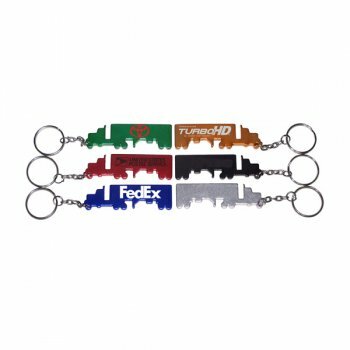 Put your promotional campaign into overhaul with this personalized truck shape bottle opener transportation keychain. This keychain is pocket-friendly due to its size and is offered in appealing price tag. Marketers who are working in extremely constrained budget can avail it in bulk and seek attractive price savings over it. An ideal promotional choice for transportation companies, distribution services, truck drivers, auto services, bars and more! It can be offered as a personal gift during celebrations or other business events. Request a quote to know price savings on wholesale promotional truck shape bottle opener with key holder. Features –Truck shape bottle opener with key holder in metallic finish. Product Size – 2 3/4" x 3/4"
Imprint area – 1 1/2" x 3/8". Imprint Area : 1 1/2" x 3/8"
Product Size : 2 3/4" x 3/4"